How Much Does It Cost to Build With Insulated Concrete Blocks? To determine the cost to build with Insulated Concrete Forms and to make your search a little easier, we’ve taken a look at the major reports on ICF costs throughout USA and Canada and boiled them down to the basics. So, How Much Does It Cost to Build With Insulated Concrete Forms? Depending on the study, you might see ICFs converted to relate to floor area, so it’s a good idea to keep track of what’s being measured to avoid any confusion. A Portland Cement Association technology brief drawing from work done by VanderWerf, Feige, Chammas, and Lemay (Insulating Concrete Forms for Residential Design and Construction, 1997) concluded ICF blocks cost builders about 4%-5% per square foot of floor area more than wood frame houses of the same design. At the time of the study, the typical US and Canadian homes cost the builder about $80-$120 per square foot of floor area, so using ICFs added about a $1.00-5.00 premium to this figure. Along similar lines, the NAHB Research Center’s Demonstration Homes Project also evaluated the use of ICFs in residential construction in 2007. They experienced up to 10% increase in total house cost, adding about 7%-8% to the final price for the buyers. The NAHB’s Tool-Base report found that ICF Blocks increased builder’s cost by $20 per square foot of floor area compared to wood frame construction. These days in Southern Ontario prices range from $16.00 to $18.00 per square foot of finished ICF wall. So where do all those studies leave us? The bottom line is this: ICFs usually cost more than wood frame. But by how much? It depends. There are so many potential influences on the price that it’s tough to nail down a solid estimate. An added cost of $15.00 – $20.00 per square foot of floor area seems to be in the middle of most of these ranges. But take that figure lightly; construction with ICFs can increase builder’s costs much less or more. It’s easy to see why there’s been so much debate on this issue. Using Stucco as your exterior finish will also reduce some of the expense of the base styrofoam required for stucco installation is already set up. ICF homeowners enjoy lower utility bills, better sound proofing, and durability. Some have estimated that the monthly savings provide a good payback on the initial investment. And then you have the benefits of a stronger, quieter, more comfortable home. The cost of ICF vs. more traditional methods of construction is typically more for the actual construction, but the cost of ownership of an ICF structure is significantly less than the more traditional methods. In nearly every documented case of the cost of an ICF structure, the return on investment (ROI) for the extra construction cost is within 10 – 15 years with many showing less than ten years. 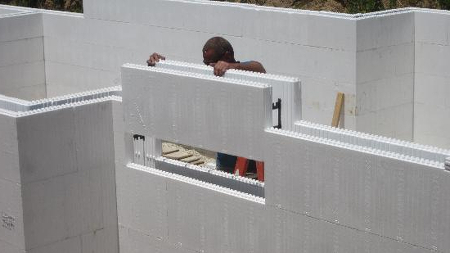 Depending how costs are viewed, ICF blocks may cost a little more or significantly less to build and operate. Do you just sale the system? If you build homes, are also in the USA…CA? If you don’t build homes, how can I find a company that is using your system to do so? Yes we build complete homes with insulated concrete forms. However, we build only throughout southern Ontario. We do not go into the USA. Sorry. I am interested in getting a quote for a formed wall project in Etobicoke. It is a relatively small project requiring approximatey 85 feet of wall (8 ft x 85 long). There would be one 90 degree turn and a walkout. Can I get contact information so someone can drop by and quote the job? I do not have plans drawn yet but have a clear idea of what I want. Sorry, we do not do formed walls.